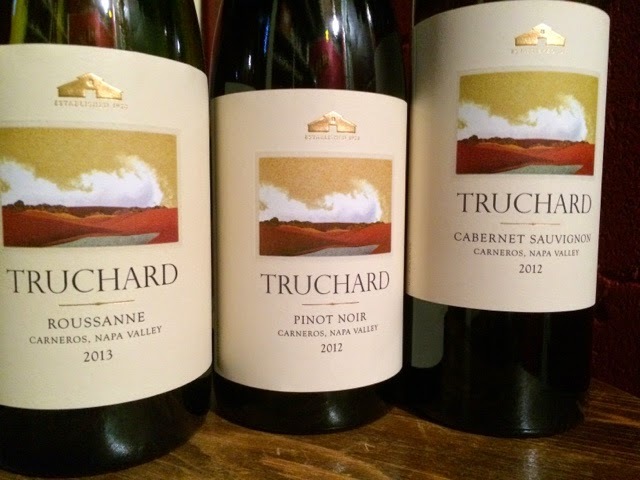 Though prices continue to inch up across the board, Truchard is one of the few remaining Napa Valley wineries whose wines are within reach for those of us without the budget for fractional jet ownership. Shrugging off the 2011 vintage, wineries are happy that the vineyard-friendly 2012 and 2013 vintages are now in bottle. The turning of tides in these vintages is evident in Truchard's bottlings, three samples of which recently arrived for review. Made entirely of estate-grown fruit from Truchard's property in Carneros (at the southern-most end of Napa Valley), there's a cohesion to these wines that demonstrates coordination and capability in both the vineyards and the cellar - a rarity anymore. Keep an eye out for these wines! Even after an hour decanted, it's still too coiled up to put a finger on. High-toned flavors across the full frequency come at you fast, with light smoke and brine in show. Needs a little time. Hour two makes an enormous difference with an explosive expansion of fruit, spice (and space), and highfalutin aromatics that make the uninitiated dizzy. Tremendous value at this price. Starts up tight, clean, savory, and reserved. Opens up quickly enough into a broad leafed archetypal Napa Valley Cabernet. All of the hallmarks are there: neat tenants, deep fruit, and racy vanilla notes percolating from the fine oak treatment. In the final analysis, pleasing and affirming. I'll confess to being a little giddy at seeing this in the shipper. Roussanne is vastly underrated and, as a consequence, rarely bottled on its own and, when it is, more than reasonably priced. Appealing for its steely finesse and bright fruit, one should not mistake this description for a light-hearted white. Rather, it's one that's capable of achieving the same levels of complexity as fine red wines. And the Truchard has complexity in spades, unfolding along the mile-long, beckoning finish.